Named for Switzerland's Emme Valley, Emmental cheese is Switzerland's oldest cheese and provides the basic recipe for all generic Swiss cheese. Cheddar, on the other hand, hails from the village of the same name in southwest England where it was first produced in the late 12th century. Swiss and cheddar differ in production, taste, consistency and use in traditional dishes, but the two are alike when it comes to aging. Off-white, ivory or pale-yellow in color, Swiss cheese typically has randomly scattered holes formed by carbon dioxide bubbles that occur during fermentation. Cheddar cheese ranges in color from white to orange; makers add annatto, a powder and paste from achiote seed, to give cheddar its distinctively bright orange color. Named for the production process of pressing the curds, or cheddaring, cheddar cheese has a more crumbly texture than Swiss. The pressing also eliminates the carbon dioxide holes. Cheddar and Swiss have distinctive tastes because they're made with different types and blends of bacteria. Use aged Emmental Swiss for a delicate and nutty flavor, and smooth texture. Some generic brands of Swiss cheese feel rubbery, slick or squeaky in your mouth, while more expensive, longer-aged brands have a more buttery texture. If you like a tangy cheese, choose cheddar, because it typically has more tang than Swiss, as well as a more crumbly texture. Like Swiss cheese, some lower-quality cheddar brands have a slick texture or chalky taste. Sharp cheddar has more tang than the milder versions, which don't age for as long as the sharp. The longer either Swiss or cheddar age, the deeper and more complex their flavors become. Look for terms like "fully aged" on labels when you buy the cheeses. The Swiss use Emmental cheese for the traditional dish of raclette, basically a plate full of melted cheese served with potatoes and a pickle to contrast the rich cheese. A cheddar and beer cheese sauce poured over toast form a traditional British dish called either Welsh rarebit or Welsh rabbit. Both Swiss and cheddar can be sliced for sandwiches, but cheddar falls apart more easily. Both cheeses melt easily, but some cheddars release more oils during the process than Swiss. Cheddar cheese is America's typical choice when it comes to a grilled cheese sandwich or macaroni and cheese, even though Swiss cheese also works for either dish. Both Swiss and cheddar are ripened, semi-hard cheeses, meaning their curds are drained and the cheeses age from a few months to a few years. 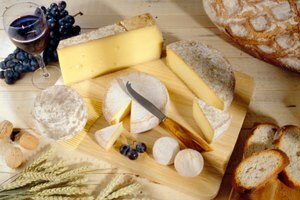 The cheeses fall between soft-ripened cheeses, such as Brie and Camembert, and hard cheeses, including Parmesan and aged Gouda. Generic Swiss cheese ripens in anywhere from 2 to 12 months or more. Emmental Swiss cheese ages for 4 to 8 months for "mature" cheese and for 12 months or more for "fully mature," according to Sharon Tyler Herbst and Ron Herbst, authors of The Deluxe Food Lover's Companion. Cheddar cheeses also age from 2 months to more than 12 months, with mild cheddar aging for 2 to 4 months, medium for 4 to 8 months, sharp cheddar for 6 to 12 months and extra sharp for more than 12 months.